Worldwide, small-scale coastal fisheries contribute significantly to providing food, employment, and incomes to many very poor people. But these same fisheries, and the ecosystems upon which they rely, are under increasing threat from a combination of climate change, pollution, over-fishing, and the exploitation of resources. Fisheries management has been a major component in trying to address some of these issues, but with limited global success. The potential of fisheries, if managed well, is considerable but what form that potential will take will depend on how and why fisheries are managed. 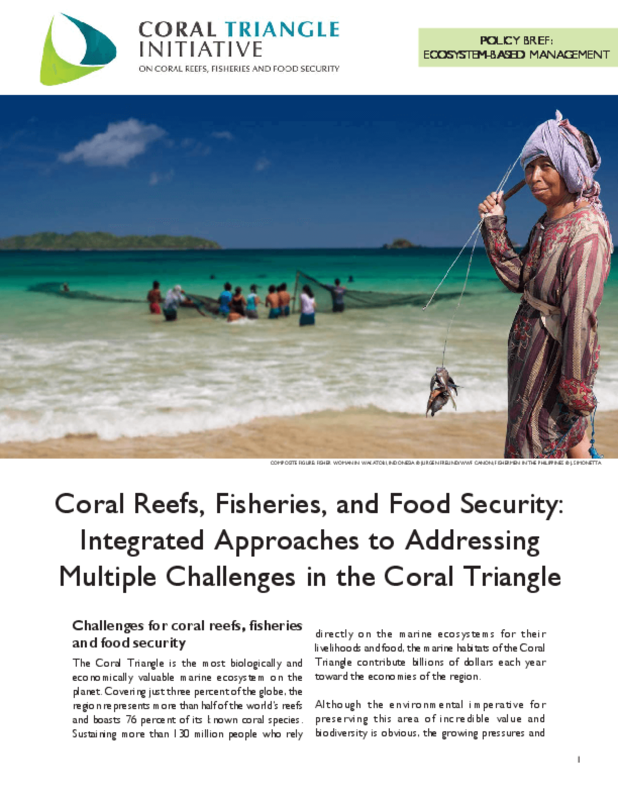 This collection of reports and presentations explores just this question, describing some of the challenges faced by small-scale fisheries worldwide and their efforts to address these challenges and improve the health and well-being of the people who are dependent on these threatened environments. The collection brings together the "grey literature" of the field, valuable work that is not readily available through academic journals and databases but is instead spread across dozens of organizational websites. This set of reports was initially identified as part of a synthesis review of key lessons commissioned by the Rockefeller Foundation's Program on Oceans and Fisheries. We are pleased to make it more easily available for others to use and build on and encourage researchers and practitioners to add relevant work to the collection. The Coral Triangle is the most biologically and economically valuable marine ecosystem on the planet. Covering just three percent of the globe, the region represents more than half of the world's reefs and boasts 76 percent of its known coral species. Sustaining more than 130 million people who rely directly on the marine ecosystems for their livelihoods and food, the marine habitats of the Coral Triangle contribute billions of dollars each year toward the economies of the region. Although the environmental imperative for preserving this area of incredible value and biodiversity is obvious, the growing pressures and threats from widespread poverty, rapid development, and global demands continue to place enormous strain on the natural marine resources of the Coral Triangle. This is a 4-page brochure about a WorldFish led project. Throughout the world, poor fisheries management contributes to resource degradation, poverty, and food insecurity. This European Union project on an Ecosystem Approach to Small-scale Tropical Marine Fisheries is led by WorldFish and implemented in collaboration with national partners in Asia (Southeastern)-Indonesia; the Asia (Southeastern)-Philippines; the Solomon Islands and Tanzania. The overall objective is to use an ecosystem approach to fisheries management (EAFM) to improve governance of small-scale fisheries (SSF). The EAFM puts sustainability and equitability at the forefront of fisheries governance which enhances their contribution to poverty reduction.Specific objectives are to: 1. Assess existing institutional arrangements and identify opportunities for an EAFM to improve integrated SSF management; 2. Develop EAFM strategies and actions suitable for developing country contexts; 3. Strengthen the capacity of local fishery stakeholders and government agencies to collaborate and work within an EAFM. The project is taking a participatory and gender sensitive approach, both core philosophies of WorldFish. Representatives of all relevant stakeholder groups are involved in this action research project. This report is found on pgs173-208 of the FAO publication "Socio-economic indicators in integrated coastal zone and community-based fisheries management. Case studies from the Caribbean". During the fiscal year 2002/03, the CRFM Secretariat requested FAO's assistance in undertaking a study on the use of socio-economic and demographic indicators in integrated coastal area management and fisheries management in the CARICOM region. The study involved three main components. Firstly, country specific case studies to be undertaken in selected Caribbean countries, namely, North America (Central America)-Belize; Dominica, North America (Caribbean)-Jamaica; St. Lucia, North America (Caribbean)-North America (Caribbean)-Barbados; Trinidad and Tobago and the Turks and Caiços Islands. These were aimed at documenting past and current initiatives in the CARICOM region, in which socio-economic and demographic indicators were used in integrated coastal and fisheries management, and also to identify ways and means of incorporating such information in on-going coastal zone and fisheries management programmes. The second component was a comparative study on the use of socio-economic and demographic indicators in coastal management and fisheries management in the Southeast Asian countries, Malaysia and the Asia (Southeastern)-Philippines; which are more advanced in this respect, in order to learn from their experiences. The third component was a regional workshop to present, discuss and refine the country specific and comparative studies, by obtaining input from all the CARICOM countries, and to make recommendations for follow-up actions to improve integrated management of coastal resources, through, inter alia, incorporating the use of socio-economic and demographic indicators in the planning and decision-making process, improving the standard of living of fishing communities, and, promoting sustainable development. This report summarizes the studies, presentations, and lessons learned from the overall project presented at the regional workshop. 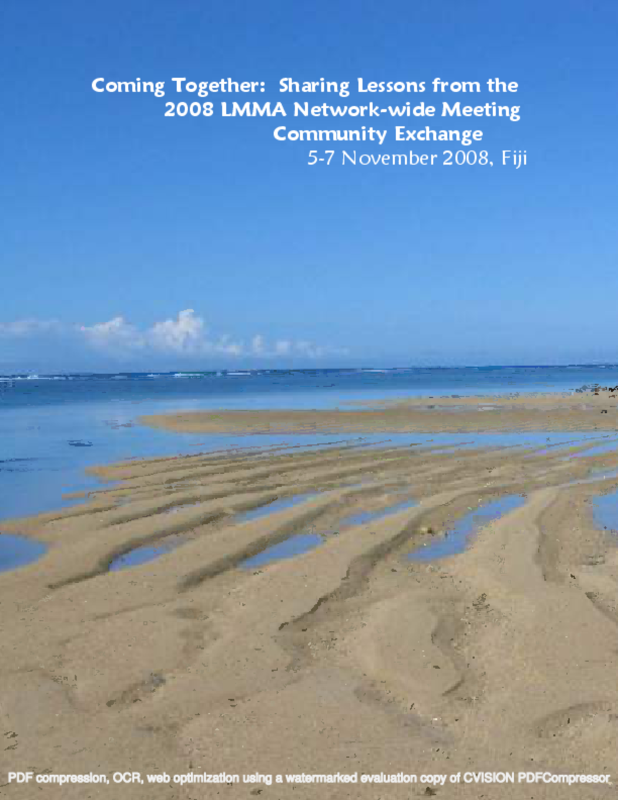 The Community Storybook is a collection of lessons, tips and experiences shared during the Community Exchange session at the 2008 LMMA Network-wide Meeting in Fiji. 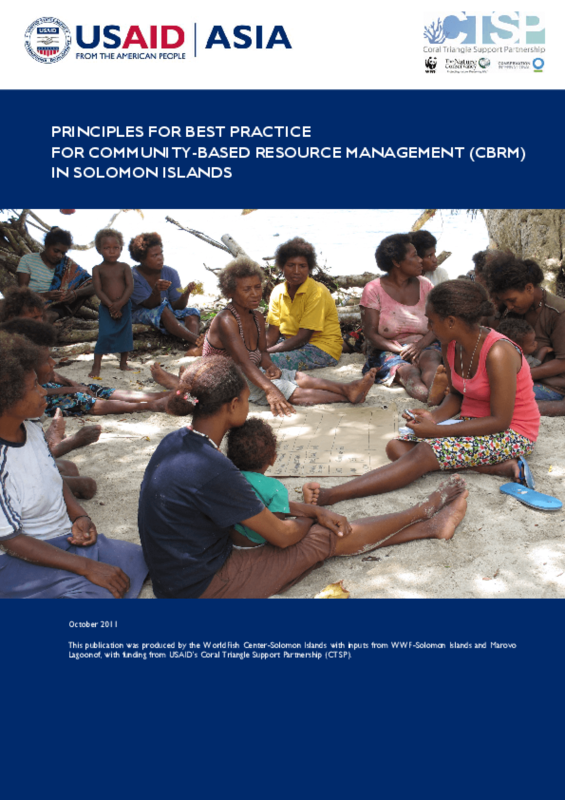 It is not intended as a comprehensive guide for community-based adaptive management (CBAM), but rather as a record capturing the key points from conversations shared by participants. It is intenteded to be strateigically introduced to communities -- that is, as part of a workshop or community awareness event, rather then simply handed out indiscriminately. We recommend to the folks on the ground who are introducing it (partners, country coordinators, etc.) to leave ample time for elaboration and discussion of the tips provided in the storybook, particularly the more sensitive or debatable ones. These guidelines have been developed to meet the aspirations of Pacific Island countries (PIC) as stated in the Pacific Islands regional coastal fisheries management policy and strategic actions (known as the Apia Policy) in which authorities agreed to take steps to achieve healthy ecosystems and sustainable stock of fish. 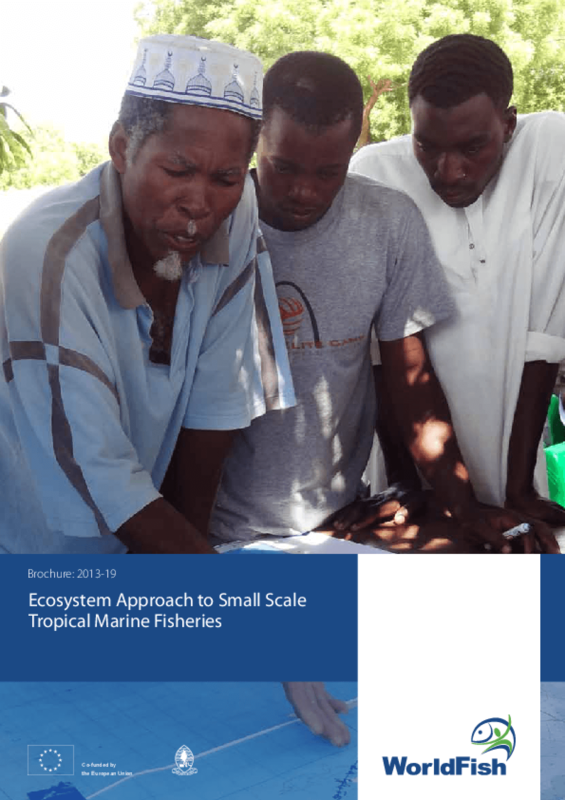 These guidelines have been produced to describe how an EAF can be merged with community-based fisheries management (CBFM) in PICs. 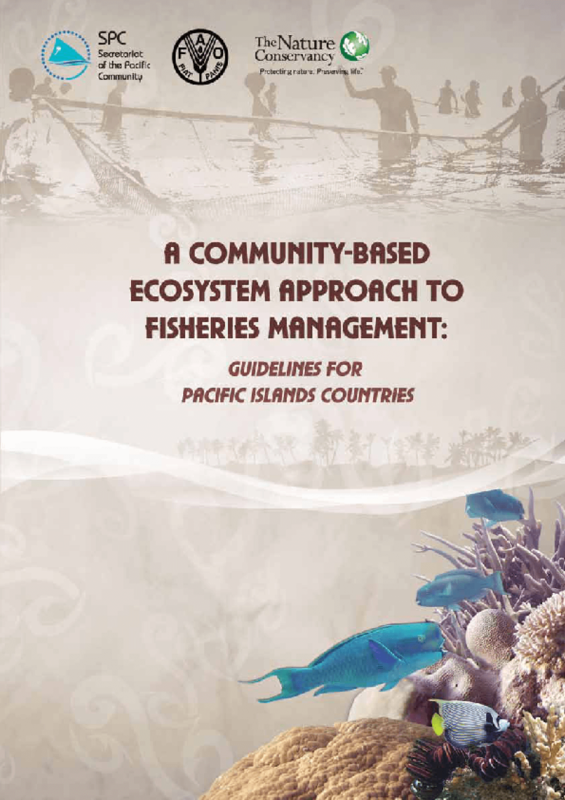 This merger of approaches is referred to in these guidelines as the community-based ecosystem approach to fisheries management (CEAFM), and represents a combination of three different perspectives; namely, fisher-es management, ecosystem management and community-based management. CEAFM is the management of fisheries, within an ecosystem context, by local communities working with government and other partners. 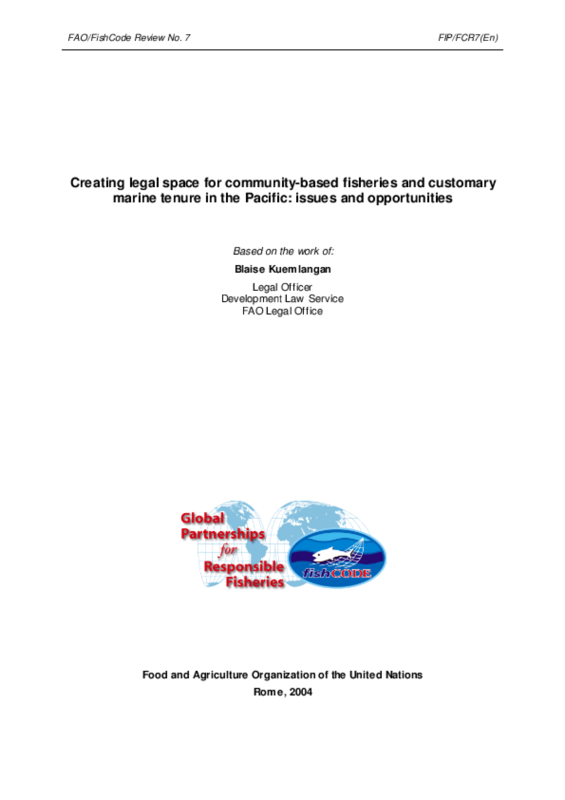 The main requirement for such a merger is the involvement of a broader range of stakeholders and access to the expertise and experience of several government agencies in addition to a fisheries agency. CEAFM is not seen as a replacement for current fisheries management but an extension that combines a high degree of community and other stakeholder participation to minimise the impacts of fishing and other activities on ecosystems. In addition to fishing activities, coastal ecosystems in many PICs are affected by excessive shoreline development and by coastal waters that contain high levels of nutrients and silt. CEAFM aims to involve the participation of community stakeholders to ensure that future generations of Pacific Island people will continue to have access to the benefits associated with sustainable fisheries and healthy ecosystems.